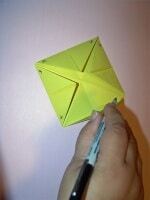 Home » Totally Free Psychic Chat » What To Write In A Paper Fortune Teller? A paper fortune teller (or also called a salt cellar, chatterbox, cootie catcher, or whirlybird) is a kind of origami that lots of children use to predict the future. Truly, it’s just a game for fortune telling. A child will ask a question, and another one will answer by opening the paper fortune teller randomly. There will be a nice and cool prophecy for the question. Of course, these prophecies are written by the children. What can you write in a fortune teller? Normally, after making the paper fortune teller, people often consider what to write in it for the best. It’s not tough too much because they enable to write anything depending on their own thought and aim. For instance, your friends love receiving interesting information about future or love issues. In addition, you are able to jot down some jokes or funny statements into the paper. Generally, you could see various things belonging to many different influences of life that you can be free to put in the paper fortune teller. Ensure that you’re interested in this category. Relying on that, you enable create food fortunes for yourself. If you love something playful, try to write some silly sayings, random thoughts, etc. For example, you will live in a cardboard box after passing through all the 5 years of university. Or love something significant and meaningful, talk about issues related to future, money, and success. Try to look at a couple of statements here to add into your paper fortune teller! It’s a good day to make new friends. Keep calm and you will be rewarded. Something you lost will come back soon. You soon discover your hidden talents. You will live happily and peacefully. You will receive a great surprise from an old friend. You’re going to receive a party invitation. You will be healthy and wealthy. Someone special will call you today. You will pay worthily with your hard works. Remember to live your life. You can get an A mark for the next test. A good luck is coming your way. Some bad news is coming. Make the fortune teller and then write down anything you love. So, you’re ready to become a real Fortune Teller and predict someone’s future.